Lawyer Keith Scotland (centre) who represented one of the petitioners, leaves the High Court after Justice Stanley John dismissed the petitions. The court can find no evidence to support the major issues raised by the petitioners and canvassed during the trial, Justice Stanley John declared before dismissing both petitions yesterday. 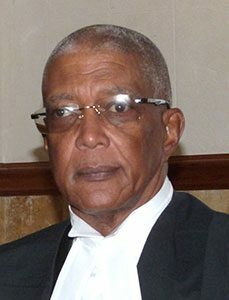 Justice John, a former Court of Appeal judge from Trinidad, delivered a summary of his judgment on the two election petitions which alleged serious irregularities in the December 9, 2015, general elections. “In the instant case, the court has very carefully analyzed the evidence of each of the witnesses, particularly of the two petitioners, the evidence of Miss Maia Eustace, Miss Shirlan “Zita” Barnwell, and the witnesses for the respondents, namely the Supervisor of Elections, the Returning Officers and the presiding officers,” he noted. He also mentioned the final report of the electoral observation mission, related to partiality displayed towards the Unity Labour Party(ULP) candidate, Sir Louis Straker, by returning officer Winston Gaymes. “…who, not surprisingly, did not attend at the hearing to give evidence and on whose behalf no explanation was proffered. Further comments about Mr Gaymes are contained in the judgment,” John stated. He continued that the authorities show that mistakes have been made in “almost all elections,” but it is for the court to determine whether these mistakes were willfully done. “That mistakes and/or errors were made in the instant election is not in dispute,” John said. The critical questions that the Justice indicated must be answered are firstly if the elections were fair and free. Opposition New Democratic Party South Leeward representative Nigel Stephenson (forefront left), walks with Central Leeward petitioner Benjamin Exeter, during protest action in Kingstown yesterday. 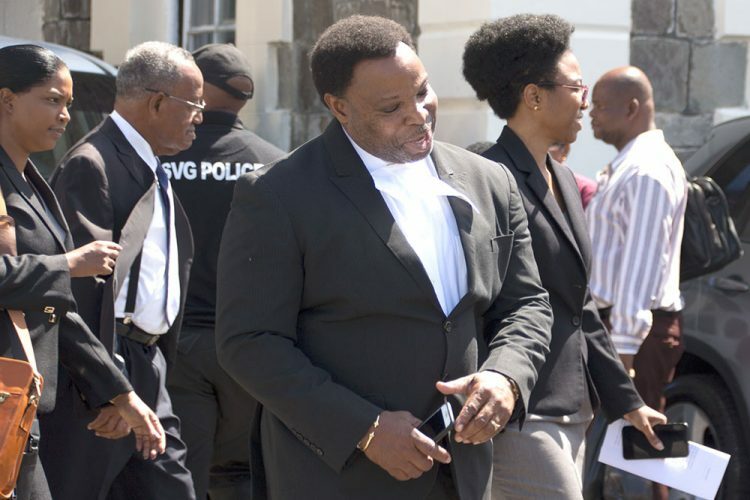 The Justice pointed out that no issues were raised to court about the 13 other constituencies, and that the concerns were with the Central Leeward and North Windward constituencies alone. He mentioned that the court paid close attention to the demeanour of the witnesses during the trial. He listed some of the important issues raised in the case, including: whether the ballot boxes were in compliance with the law, whether there were ballot papers printed with the official mark, were the form 16s or statement of the polls provided at the final count for all polling stations after voting, whether the voters folded the ballot paper in such a way that the official mark could only be seen by unfolding the ballot, was there evidence of the breach of secrecy. These were just a few that the judge named. “It therefore found, and the court is satisfied, that the elections conducted in Central Leeward and North Windward were conducted substantially in accordance with the laws as to elections in the state of St Vincent and the Grenadines, and the acts and the omissions of the presiding officers and the returning officers, were not such,” to affect the result of the elections. He dismissed both petitions and declared that ULP candidates Montgomery Daniel and Sir Louis Straker had been validly returned. The Petitioners are to pay costs to the respondents, following normal court procedure, to be assessed if not agreed. Lead lawyers for the petitioners NDP candidates Benjamin Exeter and Lauron Baptiste, counsel Stanley “Stalky” John QC, and Keith Scotland stated that they would await the written judgment to determine how to approach it. “I assure you that we are prepared, that’s what I can say. We are prepared, if needs be, for the next step, but I have to speak with the team, I have to speak with the clients, and of course I have to speak to Mr John QC,” Scotland stated. The New Democratic Party (NDP) Leader Dr Godwin Friday said that he was disappointed. “I came to the court today confident in the positions that were advanced by the petitioners and the counsel, and I am very disappointed that the court did not see the evidence the way that our lawyers, our petitioners, and I would say that a vast segment of Vincentian community, saw it,” Friday said. 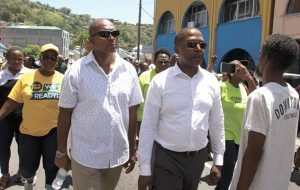 The Opposition Leader made his way over to the market soon afterwards with a megaphone to rally the spirits of the NDP supporters gathered. The respondents in the petitions are the returning officers Vil Davis and Winston Gaymes, presiding officers Kathleen Jeffers and Veronica John, the Supervisor of Elections Sylvia Findlay-Scrubb and the Attorney General. Lead lawyers for the respondents Anthony Astaphan SC and Douglas Mendes SC were not present.